The whiter than white sand, the bluer than blue water - typical Tassie east coast. Who’d have predicted that the drive up the east coast of Tassie, from Hobart to the Bay of Fires, would beat all our iconic road trips – including the world-famous Great Ocean Road, the wildly isolated Nullarbor – to take the #2 spot? What can we say – you’ll understand when you get there. 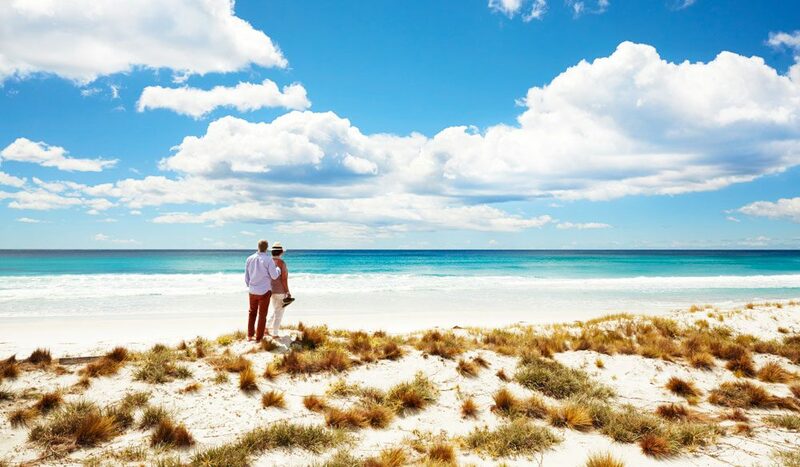 Maria Island, the Freycinet Peninsula, Wineglass Bay, and holiday mini-mecca Bicheno are all waiting to be uncovered on this trip, but they’re not the only highlights. Tellingly, the area’s most luxurious stay also came in at #5, while the Freycinet Experience was voted Australia’s best walking holiday, at #13 on this list. Basically, we all need to move here. Day 1 – Hobart to Orford: When you arrive at Orford, catch the ferry to car-free Maria Island. Spend the afternoon wandering, taking in her natural beauty. Day 2 – Orford to Swansea: Stop at Freycinet Peninsula on the way to hike or abseil the picturesque Hazards, swim those ridiculous beaches and gorge on oysters. Day 3 – Stay put: You haven’t swum with Wineglass Bay’s dolphins yet (or eaten enough oysters). Day 4 – Swansea to St Helens: Pull in at pretty seaside town Bicheno on the way. Just north of town, directly in front of Diamond Island Resort, is also a view of the area so good it was voted #22nd best view in the country in a previous AT list (so you know it’s good). Clearly didn’t do their research – Freycinet is not on the way to Swansea, it is between Swansea and Bicheno. Why would you stay at Orford when there are so many great places to stay near Swansea (e.g. Piermont) or in the Coles Bay area. Didn’t mention the great wineries like Springvale or other great places to eat. We did most of this trip last November and it is truly a great location. If you found the east coast up to St Helens fabulous you should wander a little further north to the stunning uninhabited North East coastline; Eddystone Point, Musselroe Bay, Bay of Fires. Discover the amazing short walks–the tallest and widest Australian eucalypts, waterfalls, unique granite & dolerite mountain ranges… Oh you’re right you need a lifetime to discover all these treasures! Hope to see you back here, soon.